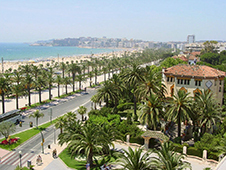 The seaside resort of Salou – the heart of Catalunya and the main tourist goal of the province of Tarragona. The city is located on the "Gold Coast" of Costa Dorada for 92 km from Barcelona. Not only Spaniards but also attracts other travelers here the opportunity to relax under the golden sun, swim in the clear water and forget about the hustle and bustle. Salou has everything for a quality vacation: clean beaches, beautiful rocky bay, a huge amusement park "Port Aventura" and the water park "Costa Caribe", and lovers of long walks will appreciate the Park "Salou Promenade." The city has good transport connections with other cities, including Barcelona. If you decide to spend your holiday in Salou, the best solution is to rent a car. At the airport of Reus (10 km away) or Barcelona you can already expect the machine on which you get to your destination, regardless of the schedule of public transport and direct. You can rent a car already in Salou, if you want to explore the surroundings of the city. Choose a comfortable car at a good price and to agree on where you will be waiting for the machine, you can use our site. beep in the city is strictly prohibited by law. For violations of traffic rules are provided very large fines - from 100 to 600 euros. The size of the penalty depends on the nature and gravity of the offense, as well as timely payment. If the driver pays the fine penalty "on the spot" the traffic service, or pay through the bank receipt within 15 days, you get a bonus: the fine will reduce by 2 times. For repeated violation or drunk driving can also take away the rights, and in some cases provided for imprisonment. The roads in Spain are actively using radar speed camera. If the police become aware of the presence in the car radar detectors, will have to pay 6000 euro fine. on the motorway - 120 km / h. Minimum speed - 60 km / h.
The most that can afford the car driver - a glass of wine or a dry (!) Of wine. The level of alcohol in the blood must not exceed 0.5 ppm. Drunk driving is a very serious violations and draws a fine of 200 euros and more. If repeated or very serious violation, which is also accompanied by alcohol intoxication, may withdraw the law, and even sentenced to prison. Designated car parking always enough. Usually you can park everywhere where it is not prohibited by the yellow markings and a sign «VADO». on odd days - on the side of the street with odd-numbered buildings. Be careful to follow this rule, otherwise the machine would be on a penalty-parking lot and you have to pay for the tow truck (about 100 euros).